Heyyyy! 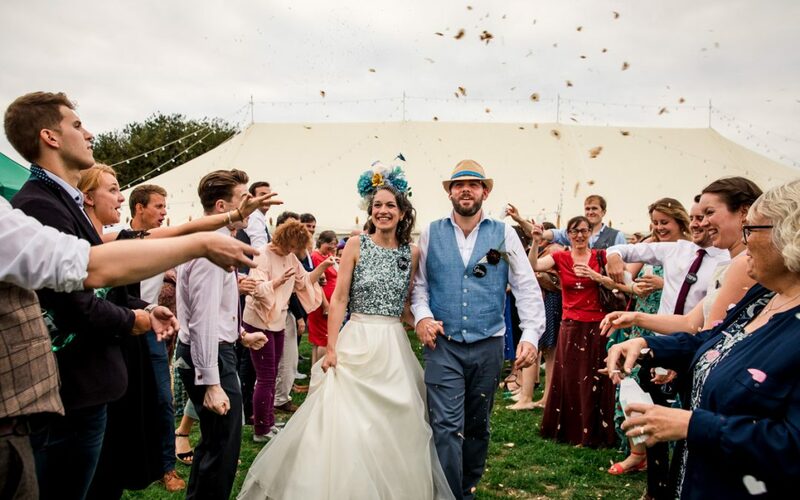 Look at this amazing wedding in gorgeous West Sussex. This was my first trip to Sussex, and southerners definitely know how to party! These guys had an amazing outdoor ceremony Coops arriving in a VW camper and meeting Wardy on the aisle. Every guest then blessed the rings as they were passed round, and as they exited the aisle guests were encouraged to make as much noise as possible with the instruments they had been asked to bring! Amazing! This was followed by drinks served from watering cans and a bathtub before heading inside for speeches and some roast lamb, which had been cooking over a pit all day. After this there was an awesome Keighley followed by the dance floor being filled for the insanely talented “Murdochs Crazy Eyes” an incredible Rock band who were amazing at every song they played. When people were dancing inside, they were outside enjoying pizzas made to order, wrapped in blankets, and making themselves comfortable on the hay bales around the open fires. “Get Wedding insurance as soon as you book the venue. Accept help from everyone who offers it. Remember it is your day and it is about the two of you. If it is important to you, do it. If it doesn’t feel relevant/value for money/necessary, don’t bother. Start your own traditions. Everything was a new idea once. Watch car-crash TV like Don’t tell the Bride, Bridezillas and Say yes to the Dress, it will make you feel better . Skirt: Bought 2nd hand from Charity shop – St Wilfrid’s Vintage and Retro in Chichester (//stwh.co.uk/) and altered to Jess’ design by local bridal dressmaker //rosemaryjanebride.co.uk/ incorporating Crystal beads from Jess’ great Aunt Adelaide Top. This wedding was recently featured on the AWESOME Rock n Roll Bride. Want a Brochure sending to you? Fill in the form below!